In this children’s book, there is so much to be learned and discovered about both our own language, as well as Native American language and customs. This historical fiction biography tells the story of genius that was behind the creation of the written Cherokee language. It turns out that this accomplishment is unique in history, as he created an entire alphabet to represent the sounds of the spoken language. Along the way, we also discover how difficult it was for his genius to succeed in an era where the Native American people were under constant threat. 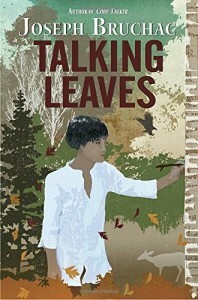 Finally, this book sensitively covers a father-son relationship, when the father was absent for all the formative years. It makes this a great book for boys. I appreciated the fact that this children’s book presents the sad facts without making them sensational or filled with hatred on either side. There is no escaping the dreadful treatment of the Native American peoples. It is important for our children to read the stories of the heroes and share the pride that they people themselves had to work hard for. I’d highly recommend this children’s book for a fourth or fifth grade classroom, whether in a formal school or a homeschool. It’s a way to bring in language arts as well as social history. However, if your child doesn’t read it in school, it’s a great one to read at home as a family.